Published: Jan. 2, 2013 at 12:11 p.m. 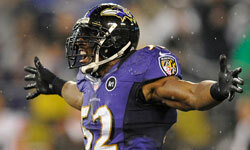 Updated: Jan. 2, 2013 at 02:53 p.m.
Ray Lewis' long and storied NFL career is coming to an end. The Baltimore Ravens linebacker informed teammates and coaches Wednesday that Sunday's playoff meeting with the Indianapolis Colts will mark his final game at M&T Bank Stadium, and he will retire at the end of the season. » Is Lewis greatest defensive player ever? "This will be my last ride," Lewis said. The seven-time All-Pro and 12-time Pro Bowl selection didn't say if he would play Sunday, but Lewis confirmed he's physically ready to take the field. Lewis was activated late last month, but he hasn't played in a game since he tore his triceps during a Week 6 win over the Dallas Cowboys. NFL.com's Albert Breer cited two sources who were in the room in reporting that Lewis addressed his Ravens teammates Wednesday. The two-time NFL Defensive Player of the Year and MVP of Super Bowl XXXV rose to his feet and spoke about playing for one other and the bond between teammates before announcing his plans to retire. "Unreal. Very inspiring. There's no one like him, man," one observer texted Breer. "I can't picture Baltimore without him," running back Ray Rice later said. Linebacker Terrell Suggs added: "It's amazing and it's sad all at the same time." With 227 starts since being drafted by the Ravens in the first round of the 1996 NFL Draft, Lewis is the beating heart of this organization and its most vocal in Baltimore's quest to return to the Super Bowl. "Everything I've done is to make another run at the Lombardi," Lewis said Wednesday. His final chance -- and our last look at this future Hall of Famer -- begins Sunday.